The Spirit of Mantra, the 2nd 21-Day Mantra Meditation Journey with Deva Premal & Miten, brought 87,000 people from 200 countries together in an extraordinary worldwide wave of chant and meditation when it was first offered online. Now this transformative, healing program is available for purchase as mp3 downloads. 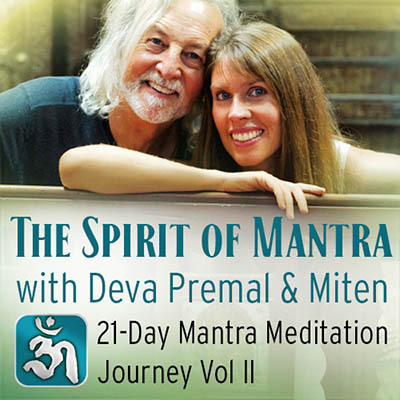 Deva & Miten explore 21 powerful mantras, explaining their meanings and offering guided meditations into the chanting. These ancient sound formulas affect us on many levels – body, mind and spirit – opening the door to a world beyond thought, where we experience deep inner peace and a true sense of well-being. “It’s a wonderful feeling to struggle with anxiety & then listen to something so soothing that peace fills your chest and you open your eyes with a smile, almost as if a new day had begun” -A.A.
“My first time ever doing this, although I’ve done a little bit of yoga in the past. This was really very beautiful. From within seconds of sitting on the floor I was feeling energy flowing through my back. The mantras, and the voice is very beautiful. I really enjoyed singing along with the mantra, and it really is very amazing to feel part of an international, but even more powerful spiritual community. Thank you.” –R.B.